Barnaby Gray, Level 2 qualified BTF coach and Youth South Central Rep for BTF is excited about the prospects of developing the junior section of the club. The Petersfield Tri Junior Club, under the direction of Barnaby Gray and Tri-High Multisports, enjoyed a busy festive season. Members of the club enjoyed structured swimming sessions, including video analysis. Parents were able to swim too with dedicated lanes and session plans available to follow. The National Park Run events at Queen Elizabeth Country Park (QECP), Havant Park Run and Alice Holt have been used for club gatherings. Members have taken part in the weekly park runs and some have then enjoyed a club mountain bike ride. QECP is our local venue and where most of our club sessions will take place in future. On January the 1st some club members challenged themselves with the Park Run Double by competing in the Havant 5k run at 9am and then hot footing it across to QECP for their 5k race starting at 10.30am. We are busy filling up the 2015 calendar with training opportunities, club events and races locally, Nationally & Internationally. The Junior Club will hopefully see its first overseas tour and a training camp is being finalised for Spring Half Term. Register for more information. Please complete the form below to join the junior section of the club. Barney is thrilled to be able to offer, co-ordinate and deliver such opportunities to Petersfield Triathlon Club and children from Liphook and the local area through his Tri-High Multisports Club for Children. 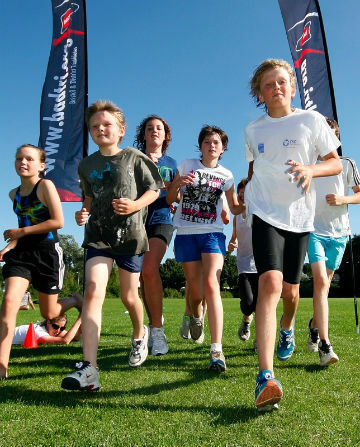 Petersfield Tri-High Club allows young people aged 8 -16 to train for and experience multi-sport events. Junior triathlon is split for competition purposes into two-year age groups (see below). Initially we will have training sessions for all young athletes at the same time; however, when the junior section becomes large enough we will split into juniors (aged 8-12) and seniors (aged 13-16). Juniors will have the opportunity to train in organised sessions where they will learn and develop skills for both healthy living and competition. We also want to encourage as many junior members as possible to enter and compete in competitions in 2015. Session plans will be communicated to registered members who can then confirm their attendence. We will make details of local competitions available as and when dates are confirmed.